You will be given a reference e-book to read which has 331 pages And the test will be based on that e-book , you can take final test within 1 year of purchase. Communication is the essential part of any culture of the world. Without communication whether its verbal or non-verbal ideas and information is impossible to share or difficult to convey the idea towards targeted people. For communication especially where it needs to communicate with unfamiliar people or across the culture, language plays an important role. Japanese certification course is based on teaching and learning about Japanese language and how to grasp over the language from grass root level in order to become proficient in speaking and understanding Japanese language and their culture. This course is specifically designed for students (who are planning to study in Japanese universities or native areas), teachers, travel guides, tourists, diplomats, language institutes and instructors as well as for businessmen and traders who have vested interested to deal with vendors from Japan. Holder of Japanese certification will be able to grasp the basic requirements for fluently speaking and understanding Japanese. Language is considered as an important element to understanding and effectively communicating with the people who belongs to a specific culture or community of the world. Just like other culture and civilizations of human evolutions, Japanese culture is also very old and considered as one of the important civilization that they have. Apart from the culture and civilization of Japan, it is also among the top ten world’s largest and technically advanced economies. This online certification will enable you to efficiently learning about Japanese and after that you will become able to speak and write in Japanese with greater accuracy. Being a tourist, travel guides, language instructor, international trader, businessmen, teacher and student, if you are planning to visit Japan or native areas for study, business and travelling purpose or you have to interact with Japanese by any mean (i.e. online, face to face and telephonic), then this certification course will provide you to ease in communication. By getting Japanese certification, you will not only become familiar with a new language and its requirements but also able to communicate and understand Japanese effectively. Japanese certification program of Brainmeasures is a unique and different program in terms of contents that starts from very basic level, designing of the course and delivery of knowledge related to language skills which will allow you to become proficient with Japanese that you require whether to deal with Japanese people or for the sake of your own requirements. This online certification will provide you a competitive edge and create the distinctive competency about better understanding with Japanese language and their culture. Throughout the course, you will learn about the basic alphabets, numerals and pronunciation, sentence formation of the language and how to efficiently speaking and understanding the Japanese. Mechanism of Japanese certification is very in-depth that start from language basics and ends up with communication in daily life. Apart from the detailed knowledge and information about Japanese language throughout the course which has been divided into four main parts, a Japanese certification final exam is also covered in the program in order to assess your learnings and skills as well as refine your knowledge about the Japanese. After a successful attempt, you will be on right way to recognize with proficient of Japanese language as well as culture and will be honoured for Japanese certification from Brainmeasures. This will definitely enable you to become familiar with Japanese and fulfil your language requirements that might be required for job, study or business. Entitlement of Japanese certification does not only add the understanding and speaking capability but causes to raise income and better flow of wealth generation. The average annual salary for those who belongs to Japanese certification can earn $70,000-$140,000 per year and this amount may vary significantly based on the repute of the business, location, benefits and experience of the related person. Although parameters of language or culture can be achieved by getting oneself to involve where it exists but proper knowledge and understanding is the more appropriate to grasp the skills and overcome the communication barrier which requires proper guidance. So, Japanese certification course at Brainmeasures is the right choice for complete knowledge and information about language and culture of Japan. This certification program is created by experts by taking into the considerations of communication needs and language parameters with an ease to understand the Japanese in an effective way. This course provide and in depth knowledge about Japanese by dividing the course into four main parts. To explore more information about the topics covered by the program, you should spend time for scrutinizing its syllabus but first you have to register an account with Brainmeasures. Below are some important topics and areas that will be covered comprehensively in Japanese certification course. Generally speaking the door is open for all individuals who are enthusiastic to learn about Japanese culture and language. 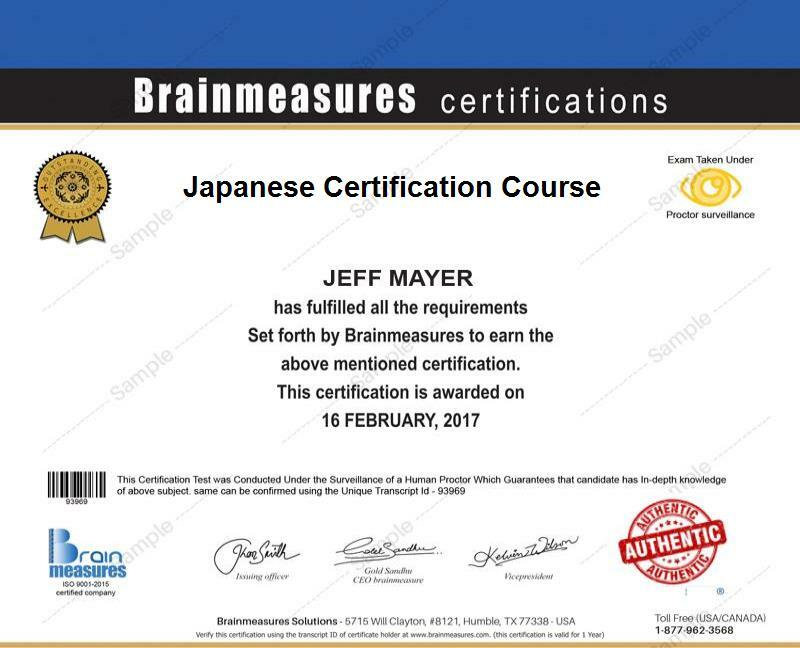 No requirement or pre-requisites are required to take part in the Japanese certification program offered by Brainmeasures. The course is ideal for multiple purposes and for larger community which entails students, teachers, researchers, scholars, diplomats, travel guides, tourists; businessmen and for those who are found of to learn about languages and civilizations of different nations around the globe.